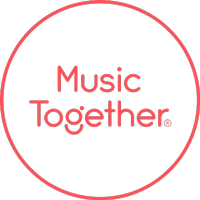 This post is the second in a series exploring the four philosophies of the Music Together® program. In our classes, we ask all grownups to fully participate … which might come as a surprise to parents and caregivers who expect the teacher to have sole responsibility for teaching the children. Our classes are designed to follow the child's needs, and we teach through the best ways children learn. We know that parents are their children's greatest and most important role models. Children are naturally wired to want to imitate and follow what their loved ones do. Children want to do what you do! Think about the most popular toys for young toddlers: they're little versions of things you use on a daily basis, like keys, vacuum cleaners, kitchen appliances, cleaning supplies, purses, work tools, computers, etc. One of the things we want to make sure all parents understand is that you are your child's hero. You are their first relationship. They look up to you and want to imitate the things that you do. With this in mind, we ask that all parents model music-making. We are not asking you to sing perfectly in tune, play along on a guitar, or lead songs the way your teacher does in class. We are asking that you simply model music-making, because your child can only acquire the disposition for music-making directly from you. Many of the children in class do imitate us teachers, but when they see you singing and dancing, music-making becomes part of their family culture. Parents with young children have a wonderful opportunity to instill the values and rituals at home that are important to you. This is an exciting time in a young family's life, and you can create a safe space for music-making where your children can thrive. All we are asking of you is to sing and dance with your kids! Your children will learn more from you than from their teachers or class guides. Did you know that you really are the student in class? We are giving you the tools for creating a musical environment at home, in the car, on a plane, on vacation, at the pediatrician's office, or wherever you go! We are encouraging you to connect and bond with your children through music, knowing that you have a huge impact on their early childhood music development. We give you the tools to create lifelong musical memories with your children and to help them achieve basic music competence through play … and through watching you. So, when in doubt … sing! Thank you for giving your children he gifts of your time, energy, and love! We encourage you to tell your children how much you love and appreciate them. Then take it one step further — sing it to them. Right now, you have the most comforting, loving sound for your children. There's no greater voice than yours! That might change as they grow older, but there's nothing like your loving sound. Mark your calendar for our next Family Concert, coming up on March 11, 4:30 pm at Levy Park!